How much does it cost to travel to Wales? How much money will you need in Wales? £91 ($119) is the average daily price for traveling in Wales. The average price of food for one day is £17 ($22). The average price of a hotel for a couple is £131 ($170). Additional pricing is in the table below. These average travel prices have been collected from other travelers to help you plan your own travel budget. While it's not terribly full of people, Wales definitely has its fair share of castles. This beautifully landscaped country is practically covered in majestic castles. These castles, and the country's rich history, created a popular tourist scene in Wales after it's time in the coal industry faded. This little country to the west of England is a part of the larger United Kingdom. The UK, or Great Britain, is made up of England, Scotland, Northern Ireland and Wales. Remember that those are four different countries when talking to the locals. And the locals will want to talk. With a strong Celtic background, the Welsh are some of the funniest and friendliest people in the world. With the rugged landscape and wild coasts, you'd never guess that this little country is only a two hour ride fro the bustling metropolis of London. The two areas are starkly different. The rolling hills and stunning beaches should provide any traveler with enough sights to see for days. Some of these highlights are special to Wales and definitely should not be missed. The gorgeous mountain range of Snowdonia includes 14 different peaks rising over 3,000-feet high. Hop a train to the peak of Snowdon for a 3,546-foot view of this grand area. Another pleasant view can be found at the Haford Estate. These restored woodlands let visitors wander through 18th century gardens, waterfalls ancient trees and walled in gardens reminiscent of The Secret Garden. Built in the 13th century, Caernarfon Castle is one the many castles in Wales. With thirteen towers and two gates, however, this one is one of the largest and most impressive. It is widely known as the best-preserved medieval fortress in the whole of Europe. Culturally and geographically, Wales is divided into three different regions. North Wales is primarily rural with the highest mountain peaks in the United Kingdom. Mid Wales is lightly populated with mountains, moorlands, forests and a gorgeous coastline facing the Irish Sea. Finally, South Wales is the most urbanized region with two-thirds of the country's population living there. With the highest mountain peaks in the whole of the UK, what else would any active traveler want to do but hike? There are great trails for hiking and climbing through the region of Snowdonia, and the Black Mountains in Brecon Beacons National Park is a 520 square mile park covered in caves and waterfalls. The Devil's Bridge is a great destination for any traveler seeking a bit of advanced hiking. Just outside of Aberswyth, this area contains the Falls Nature Trail to Jacob's Ladder. This steep climb will take you to the oldest bridge in the country and a stunning view of the whole area. 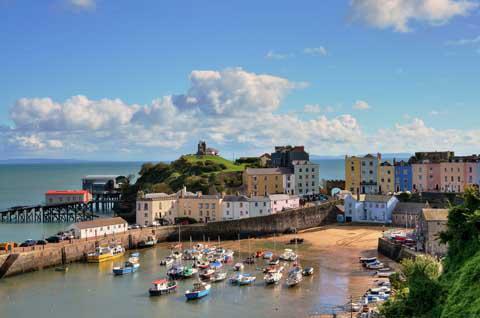 And, of course, Wales is known for its many festivals throughout the year like the Brecon Jazz Festival, Hay Festival, Dylan Thomas Festival, and more. Check the dates and if you're visiting during one of these legendary festivals, plan to take a visit. Because of the topography of Wales, getting around the country is more difficult than you would think. Traveling between the north and south, through all of those mountain ranges can take at least four hours. It is full of breathtaking scenery, though. Beware if you're planning on renting a car, these roads can be busy and difficult to navigate if you're not used to them. There is no true Welsh railway. There are simply three limbs of railways that extend into North Wales, one to Aberswyth in Mid Wales, and a main line to the South. If traffic is agreeable, the buses are your quickest option for getting around in Wales.